CAKE was founded on the belief that our team should strive to provide superior customer service in addition to an innovative product. Our goal is to create an exceptional user experience for our customers. After all, it is always nice to put a face to a name and meet the people you interact with on a daily basis! We want our customers, prospects and industry advocates to get to know the faces behind the product. We hope you enjoy! Today we introduce you to David Wilson, a member of CAKE’s Development team based out of the California office. David began his CAKE career in October of 2012. Prior to working at CAKE, he worked for an ecommerce division of Junction Solutions. If I could pick my own role, it would be “Master Facilitator.” I direct the application development of the team, assisting in execution, driving the projects, and helping shape the roadmap. I coordinate among each of the development teams, making sure that every team has every resource they need, and nothing blocking their way. I assess prioritization of workload, and mentor the team technically through the implementation of new features and resolution of issues. CAKE is filled with people who are really intelligent, dedicated, and frankly a lot of fun to be around. The people make the culture, and make the company. Secondarily, we work in an industry that has a really unique set of technical challenges. This attracts some very stellar talent, which produces a really fantastic environment for a technical guy like me. At CAKE, we really care about your success. I mean really care. We’re very proud of our work, and our brand and have every desire to be successful – and we absolutely understand that this means making you successful. Our system is robust, powerful, and dynamic, and we’re constantly envisioning ways to improve the system for all of our clients, to make it faster, more reliable, and easier to use. You can help too! We’ve created a great team of individuals in all areas of our company and they’re here to help you out, so take advantage of the resources you’ve been given, ask for help from your account managers on how best to make CAKE work for your business, offer suggestions on new features, and let the Support team help you resolve issues. I love to rock climb (boulder) with my friends, surf with my brother-in-law, or be involved with the Men’s ministry at my church. 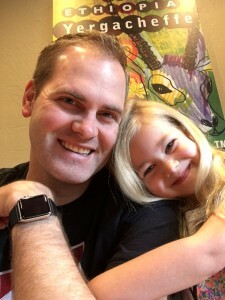 Mostly though, I spend a great deal of time with my wife and 5 year old daughter, and find all sorts of ways to invest into the two of their lives in fun and exciting ways (I’m pretty sure most of my fitness comes from frequent family dance parties in the living room). I’d say (quality) sushi, because that’s certainly my favorite meal… but your question didn’t state that someone else was paying for it, so that would certainly break my bank. Therefore, I’ll say burritos. I look pretty great in a princess crown.